Designed to add a touch of glamour and vibrancy to your look, this sumptuous created emerald ring with dazzling diamond set shoulders is simply irresistible. Crafted in chic 9ct white gold for a fresh feel. 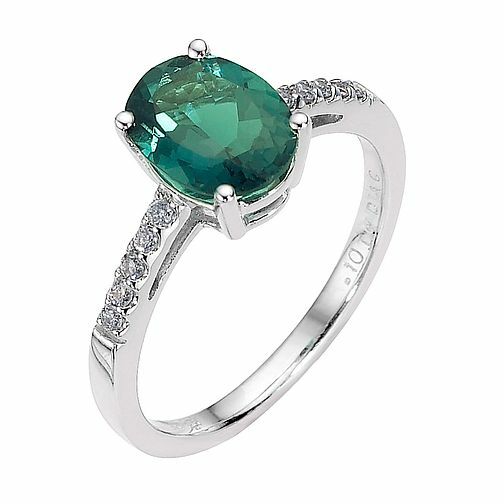 9ct white gold created emerald and diamond ring is rated 5.0 out of 5 by 2. Rated 5 out of 5 by Anonymous from Truly beautiful ring My boyfriend proposed to me on New Years Eve with this ring and it is absolutely exquisite! I have held off writing a review until I've lived with it properly, but it's absolutely impossible to fault this ring! The emerald is a beautiful stone, it's a lovely looking ring and the design is perfect... my fiance also said that everyone who worked in Ernest Jones Yeovil was extremely helpful as he went in asking for an emerald ring (my only specification!) and they were amazing with him, as he admits to knowing nothing about jewellery and was really nervous going in. We have both bought our wedding bands there since, and once again they have been extremely helpful every time we've been in. The most perfect ring from the most perfect man! Rated 5 out of 5 by Anonymous from Beautiful ring! The picture of this ring simply doesn't do it justice! I would never have chosen this ring from the picture but I bought it in shop. The colour of the emerald is striking, and the setting is a classic design that is sure to never go out of fashion. I absolutely love it and recommend it. If I was being overly critical, my only negative is that the band is quite thin compared to other rings I've had but it is a perfectly adequate band.